These past few days have been really hard to be a Miami Dolphins fan, but my reasons for suffering probably aren't the same reasons as yours. In fact, there is really only one move that Jeff Ireland has made this offseason that I really disagree with, and that is cutting FS Yeremiah Bell. Not only did Ireland cut him a week into free agency (which would make it harder to find a team needing a starting safety), but he also cutting him just a few weeks after saying that he wouldn't and that he was irreplaceable. It was a cold move that resulted in the Dolphins losing a veteran who has been in Miami for his entire NFL career on bad terms. Releasing Bell was a heartless thing to do, and it was one thing that Jeff Ireland did that really made me not proud to be a Dolphins fan. Aside from that terrible decision, I can't say I'm all that disappointed with this offseason so far. I know that a lot of you probably just read that sentence with disbelief and even anger. Who does this Paul guy think he is that he can say that our offseason hasn't been a complete travesty? How can he be confident in a team that just signed a 34-year old quarterback after "missing" on a young free agent quarterback who had very strong connections to our current head coach? How can he say that we've had a good offseason (and yes that is what I'm implying) after we traded away our best wide receiver and have no legitimate number one option to throw to? But you know what? I doubt that long questions like those popped into your head. Something simpler like "this guy's an idiot" is probably more likely, and look, I get it. We didn't get Peyton Manning or Matt Flynn. We traded Brandon Marshall for a good bit less than what we gave up for him. We cut our starting strong safety when we already have enough problems at free safety. The national media is taking shots at OUR Dolphins like it's going out of style. Well you know what? I'm getting tired of it all. The Miami Dolphins are not the biggest losers of this year's free agency. I don't care how many articles that you read that say that they are. I don't care how many experts say that they made all the wrong moves. None of that matters, and you need to stop listening to that. Do you remember last offseason when free agency opened and everyone thought that the Eagles were the big winners and it was Super Bowl or bust? What happened to them? They didn't even make the playoffs? How about the San Francisco 49ers? No one really thought that it was a good idea to keep Alex Smith. How did that turn out for them? They made it to the NFC Championship game and were a botched punt return away from going to the Super Bowl. Do you get what I'm saying? It isn't all doom and gloom for the Miami Dolphins. Who cares what everyone in the world seems to think? It means nothing when regular season actually starts up. Heck, it doesn't mean anything right now. It's just a bunch of talk. Quit your whining and hear me out. First, I will get to the talk that matters most to practically everyone in the world: quarterback. David Garrard is not a bad signing. I don't care how old he is (kind of). He is a highly accurate quarterback who has a career passer rating of 85.8, 89 career touchdowns, and 54 career interceptions. And you know what? He might not even be the starter. He will be competing with Matt Moore for that spot. What Miami has now is two solid quarterbacks who will be working their absolute hardest to win the starting job. Complain all you want, but the Dolphins are better off at quarterback than they were last year. So what if we didn't get Matt Flynn? Riverdog has said this many, many times over the past month or two. We will be able to tell a lot about Flynn by how hard the Dolphins pursue him. If Jeff Ireland wasn't willing to pay Matt Flynn top quarterback-type money, then it's because he and Dolphins head coach Joe Philbin didn't think that he was a top quarterback. Philbin obviously knows Flynn really well because he has coached him for the last four years. If he was really convinced that Matt Flynn could be a franchise quarterback, then Ireland wouldn't have minded paying more for him. Just like last year with Kyle Orton, Flynn wanted franchise quarterback-type money (or close to it) and Ireland wasn't willing to do it because he didn't view him as a franchise quarterback. Ireland was right last offseason with Orton even amid the outrage by fans. Why have we decided to doubt him now? He is a superb talent evaluator, and we need to start trusting him more. Did you really want more of this? Now, on to the Brandon Marshall trade. I couldn't agree more with the decision to trade Marshall. Let me ask you something. When you look at a team like the Green Bay Packers or New Orleans Saints do you see any receivers that are unhappy when they don't get the ball? Do you ever see them in the news for anything other than football? No, and no. Brandon Marshall is not the type of receiver that would fit into the Packers offense, and therefore he is not the type of receiver that the Miami Dolphins want. Joe Philbin is going to build Miami's receiving corps the right way: through the draft. It's what he did in Green Bay. Why not let him do it here again? And, the Dolphins got two 3rd round draft picks. Why not use those two picks to draft wide receivers that are all about the team and not themselves? And last, but absolutely not least, to this #OccupyDavie crap. This is the main reason for me giving this post the title that it has. Does anyone who supported that stupid little get-together realize that they are only reinforcing the thought that the Miami Dolphins have some of the worst fans in the league? I mean, what better way to prove that we are a terrible fan base then to start protesting the team with signs. Thankfully only about 20 people showed up, but it was still an awful idea. 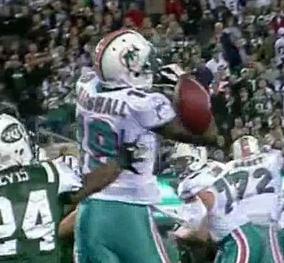 Miami Dolphins fans need to start thinking more objectively about this team. Sure, we don't have a true franchise quarterback just yet, but we have two very good quarterbacks, a great defense, and a lot of potential on offense that will only be helped by our offensive-minded head coach. I will admit, I have been frustrated more than a few times this past week, but I have since calmed down and looked at what we have. Trust me, we aren't that bad off. So stop this protesting crap. You are only making us all look worse. It helps absolutely nothing. And one extra thing. Did everyone forget that we had a top 6 defense last year even after a terrible start to the season? Those players didn't just disappear as soon as the season ended. 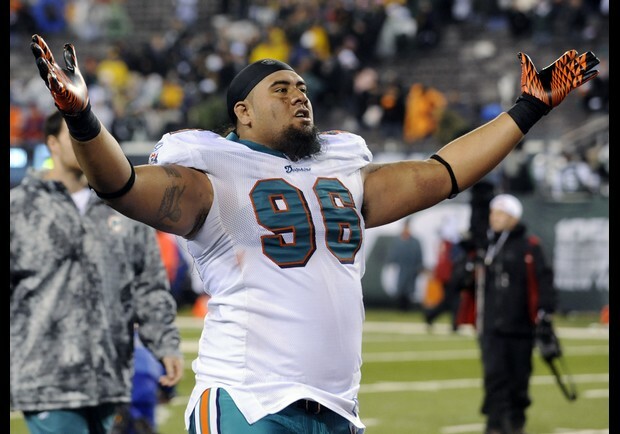 We re-signed Paul Soliai and added more depth to our secondary by signing Richard Marshall. Yes, we lost Yeremiah Bell, but even though it was a terrible move from a personal standpoint it wasn't a terrible move from a football standpoint. Bell did add veteran experience, but he was due a lot of money and wasn't good enough to deserve it (Pro Football Focus had him ranked 77th out of 87 qualifying safeties). Once again, I don't like cutting him in the way that they did, but it is an unfortunate part of the business of football. Just be patient Dolphins fans. You're acting like the sky is falling, but actually we're better off than we were before. We have a better head coach who will get us the receivers that we need, a better group of quarterbacks, and a better offense. Just wait until the season. I guarantee you that every single expert and analyst out there will be eating their words. Who cares what the national media thinks? They have a limited perspective because they have to keep up with all 32 teams. They don't know what the Dolphins really have. Just trust me. Jeff Ireland is more than capable of building a winning team. Thank you for taking the time to read this post. I hope you enjoyed, and if you disagreed just let me know below. I will try my best to respond to you. Follow me on twitter: @PaulDSmythe.